From 20th Century Fox Home Entertainment, the 'Planet of the Apes 1968' 50th Anniversary Edition version in digital HD (Blu-ray and DVD also available) is a wonder (3.5 out of four stars). The human rights filmmaker discusses his new feature-length documentary/narrative hybrid. 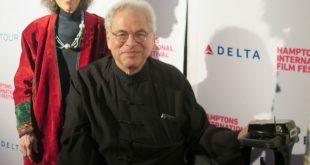 How well do you know the effervescent Itzhak Perlman? Alison Chernick's documentary about the great violinist is a delightful portrait of the man and the myth. 'Rumble: The Indians Who Rocked The World' will make you listen to everything from country to jazz, blues, and rock in a whole new way. If 'American Valhalla is to be Iggy Pop's last hurrah than he has picked fitting people to go a Viking with before he rides off to his Valhalla. From British mysteries to must-see PBS documentaries, Acorn Media has titles of great joy to offer this year. Director Alden Peters' debut feature is an intriguingly personal documentary chronicling his experiences of coming out in the digital age. 'What Happened, Miss Simone?' is a great documentary about an amazing woman that comes with a bonus CD containing some of her greatest songs.